Getting a 60 day tourist visa to Thailand is much easier than you may think. That is why I thought it important to outline the steps on How To Get A 60 Day Tourist Visa To Thailand. If you are in any major city in the United States chances are there is a Royal Thai Consulate near you. To get your 60 day tourist visa to Thailand will require you to pay a visit to the Royal Thai Consulate. There is an application form that you must fill out and bring in with you. You must also bring some information about yourself, of which, I will outline in this article. First you will need to download the PDF application form and fill it out. I recommend using black or blue ink only and print very clearly in all capital letters. Do not complete the form in cursive script. Also do not write fast and sloppy. The person who will review your application form may deny you if it looks like you have rushed through completing the form. 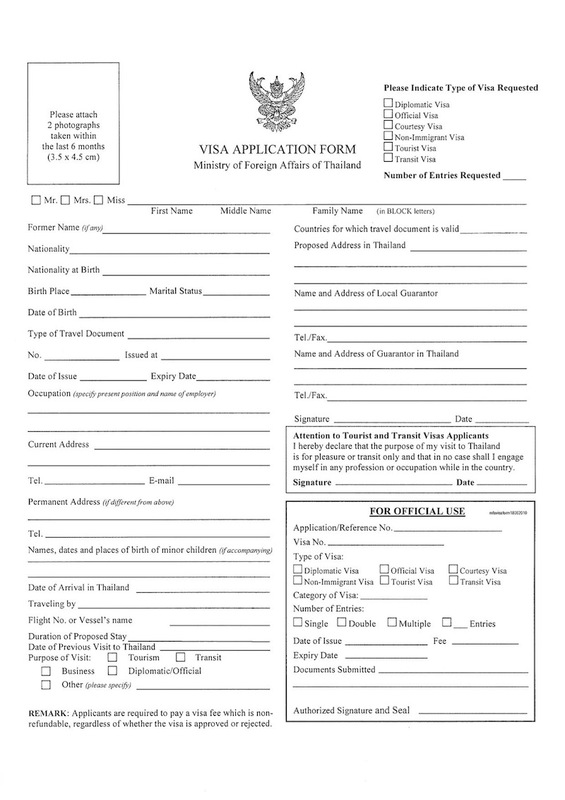 This is what the basic application form looks like for a visa to Thailand. Second you will need to passport style photos. When you get your passport photos wear an all black shirt. Wearing a suit and tie is also acceptable. It is not a good idea to wear a loudly colored shirt when you go to take your passport photos. There are many places to get passport photos professionally taken and in many cases it only takes 10 to 15 minutes. Most Walgreens drugstore or CVS drugstore locations have passport photo equipment. Some local for photographers may also have the correct equipment to take passport photos. Going to a professional photographer can be a great idea as well because they can Photoshop a shirt in any color and make it look like you are wearing it. Third. You will need to take screenshots of your bank account. When you take screenshots you will need to have the date and the total available balance visible. You will need to show that you have more than $700 US available to you. Print the screenshots and submit them with your application form. Fourth. You will need to get a cashiers check or a money order for the total application fee. Upon the writing of this article the fee was US$40 but it may have changed so double check. The Royal Thai consulate will not except cash for the 60 day visa application fee. Fifth. You will need to make photo copies in color of your passport and your drivers license. You will need to submit these with your application. Be sure to print them in color and use a high-quality printer so that they are easily readable. If they are not readable to the person reviewing your application your application will be denied. Sixth. You will need to show that you have a flight to Thailand and leaving Thailand. Your arrival flight can not be more than 30 days from the time of application submission. Your departure flight can be up to six months from your arrival or more, however you must show a departure flight from Thailand. Seventh. Make your plan to visit the Royal Thai Consulate. I would suggest planning on arriving at the consulate in the morning as soon as they open to avoid a line. Most Royal Thai Consulate offices break for lunch in the middle of the day. This means that you will have to be at the office either before or after lunch. Be sure to double check the lunch break for your Royal Thai Consulate office. Also. There are TONS of Thai holidays as well as American holidays. The Royal Thai Consulate observes BOTH American and Thai holidays. Make sure the day you plan on visiting they will be open! Here are two places to check holiday schedules. Eighth. I have at least $10 in cash with you when you go. The Royal Thai Consulate personnel may offer to mail your visa to you at your home. 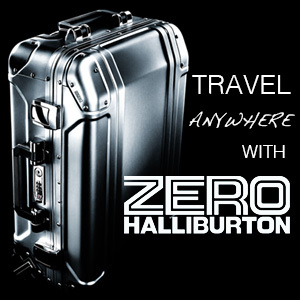 This is a great option if you have to travel from a rural location to a major city to apply for your visa. Visa application fees must be paid in a cashiers check. Mailing fees for the 60 day tourist visa must be paid in cash. If you choose to take the option and have your visa mailed to you they will send it via USPS priority mail with a tracking number. Be sure to retain your tracking number so that you can monitor your packages progress through the mail. Ninth. When you receive your visa check it over and make sure that all of the dates are correct. Do not assume that no mistakes were made during your approval process. The staff at any Royal Thai Consulate is very competent and very trustworthy however humans make mistakes sometimes. Always double check your dates! Tenth. When you arrive in Thailand be sure to have your passport open to the page with your 60 day visa. This is the most important. You have to be sure that you alert the immigration official that you already have a 60 day visa. If you do not do this the immigration officials will assume that you are getting a 30 day tourist visa on arrival. I am not sure what happens if you get a double visa and I don’t want to find out. Neither should you. Be sure to show the official your 60 day visa. So those are the steps on How To Get A 60 Day Tourist Visa To Thailand. It is not very difficult to do at all. Getting a 60 day visa only requires you to have the correct paperwork. The Thai people love tourists visiting their country. They will welcome you with open arms but only ask that you respect their land while you are enjoying yourself. Have fun on your 60 day visit to Thailand!